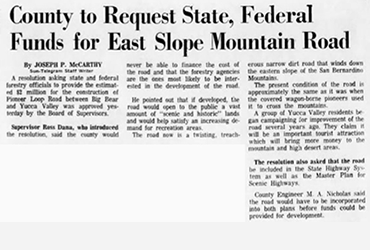 With the last link of approximately two and a quarter miles rapidly being closed, a new short cut from Pioneertown to Big Bear valley will be completed by summer and the mountain area it will be brought to within 65 miles of the Village, according to W. E. Schmidt, of Rattlesnake Gulch, a pioneer of the mountain area. Schmidt was in town last week, coming across the desert from 29 Palms where enthusiasm over the new short cut road into the mountains is high. 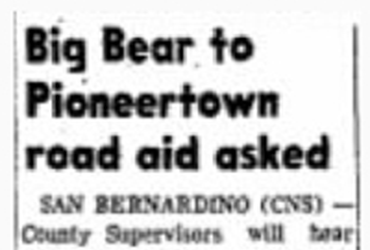 THE ROAD has already been built from Pioneertown to Burns canyon and there remains two and one-quarter miles to go to Rose Mine from which spot a road exists into Big Bear. Schmidt said the road is being built by private funds and labor. Equipment and man-hours have been donated to the task and many have contributed cash. 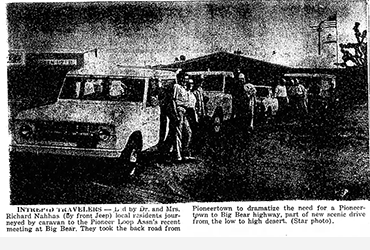 Any others who wish to contribute to the road may do so by sending their check to Mrs. W. H. Schmidt, mother of the pioneer, who is keeping a close tab on funds contributed. Her address is 1 care of Yucca Valley post office, Pioneertown. VOLUNTEER CREWS are building the road which is a good mountain road of easy grades. Equipment has been loaned by Ray Hopman and Pioneertown and the forestry service has promised to improve the last stretch between Rose Mine and Big Bear valley. There is a road to Pioneertown from the 29 Palms road now and when the last stretch through the mountains is completed, the long trip to Redlands or San Bernardino and then to Big Bear I will be eliminated and the mileage. now around 100 miles, will be cut to a little more than 60. THE NEW ROAD will also be available as a link in the proposed highway linking Morongo, Joshua Tree, Yucca and 29 Palms with the coastal area without the present dip south through Beaumont and Banning along Highway 99.